Representatives Issa and Cummings of the House Committee on Oversight & Government Reform, and cosignatories of the February 4 letter to OIP. 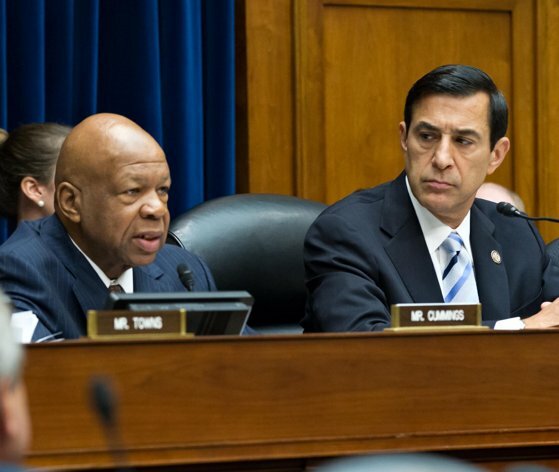 On February 4, 2013, Representatives Darrell E. Issa and Elijah E. Cummings, Chairman and Ranking Member of the House Committee on Oversight and Government Reform, sent a letter to the Department of Justice’s Office of Information Policy Director (OIP), Melanie Pustay, seeking explanations for outdated agency FOIA regulations. The letter cited the Archive’s latest FOIA audit as proof that regs were generally woefully outdated, and asked OIP to respond no later than February 22. OIP is the federal component “responsible for encouraging agency compliance with the Freedom of Information Act (FOIA) and for ensuring that the President’s FOIA Memorandum and the Attorney General’s FOIA Guidelines are fully implemented across the government.” It should have answers to the Committee’s questions, which included asking for concrete examples of things OIP has done to encourage agencies to update their FOIA regs, to explanations why OIP has fallen short ensuring that agency FOIA regulations reflect the most recent amendment to the FOIA, the 2007 OPEN Government Act. While the House’s letter contained no trick questions, as of late March there was still no response, so the Archive submitted a FOIA request to OIP on March 27, 2013, for all documents regarding answers to it. 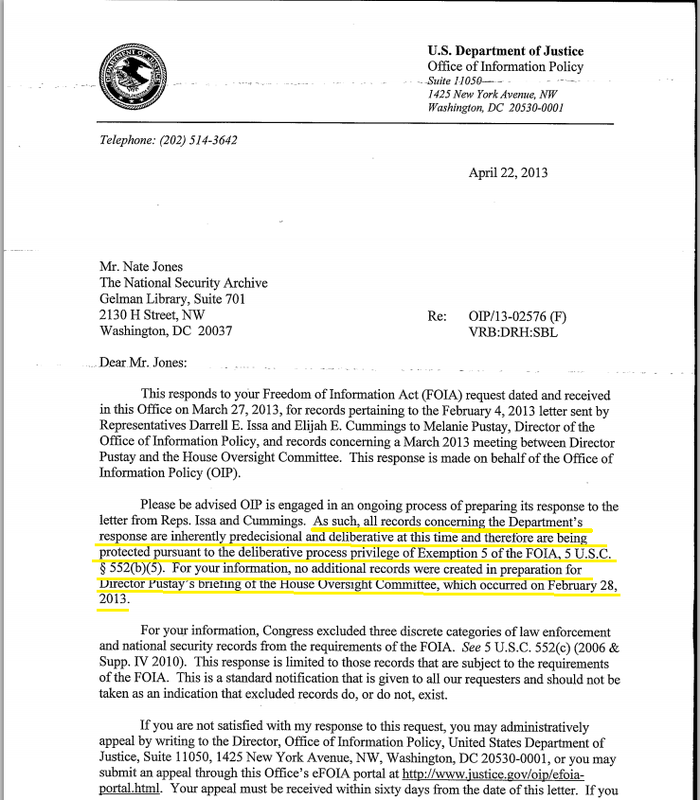 In response to our FOIA request, by letter of April 22, 2013, the DOJ informed us that “OIP is engaged in an ongoing process of preparing its response to the letter from Reps. Issa and Cummings. As such, all records concerning the Department’s response are inherently predecisional and deliberative at this time,” and therefore all records were fully withheld pursuant to exemption (b)(5). DOJ OIP, the federal component responsible for “encouraging agency compliance with the Freedom of Information Act (FOIA),” withholds documents for Director Pustay’s public briefing before the Senate. The exemption OIP cited for all of its withholdings is the very same exemption it instructed all other agencies including the DOJ to use as sparingly as possible. The exemption is discretionary and intended to prevent foreseeable harm, not to disguise agency wrongdoing, shield agencies from embarrassment, or provide a convenient excuse not to process a complicated request. To claim that these records are entirely exempt from disclosure on this discretionary exemption is insulting, especially considering the withheld documents were used to prepare for Ms. Pustay’s March 13, 2013, testimony before the Senate Judiciary Committee, during which she stated “I think all agencies are in compliance with the OPEN Government Act.” The hearing was open to the public and available for viewing online. 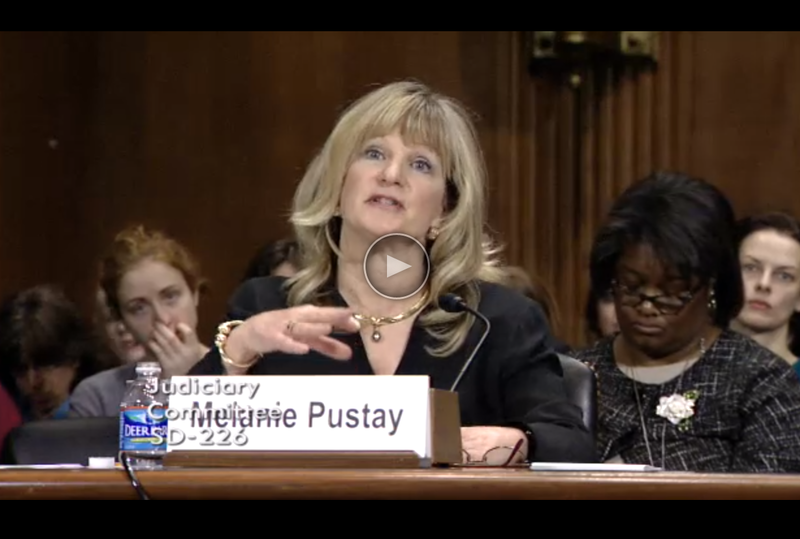 OIP director Melanie Pustay testifying before the Senate that she believed all agencies were in compliance with the OPEN Government Act. Archive Director Tom Blanton testified after Ms. Pustay refuting her claims, but OIP didn’t stick around to listen. Given OIP’s mission and the obvious problems with outdated agency FOIA regs, the questions in the House Committee’s letter should have come as no surprise. At a minimum, OIP should practice what they preach and release the documents to the public, not just Congress. More importantly, they should behave like the FOIA-standard-bearer they are supposed to be and ensure that all agency FOIA regulations are current and reflect good law.